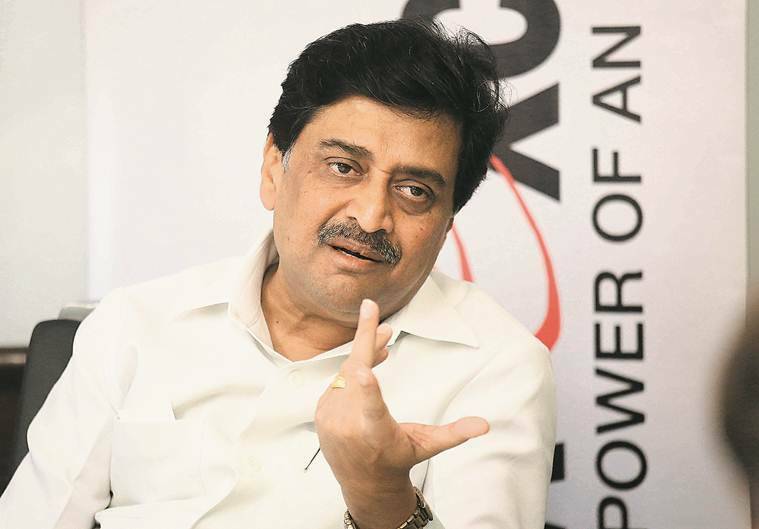 In the tape, Maharashtra Congress president Ashok Chavan, a former chief minister, is heard expressing displeasure over the selection of the candidate for the Chandrapur seat, and claiming that no one in the party has been listening to him. Rampant factionalism and widening cracks have hit the Congress’s election campaign for the Lok Sabha polls in Maharashtra. An audio tape, which went viral on Saturday, illustrated how the cracks within the party ranks have widened further after the party declared nominations for 17 out of the 24 Lok Sabha seats it would be contesting in Maharashtra as part of the Opposition’s alliance. In the tape, Maharashtra Congress president Ashok Chavan, a former chief minister, is heard expressing displeasure over the selection of the candidate for the Chandrapur seat, and claiming that no one in the party has been listening to him. Chavan has not denied that it is his voice. In the purported conversation with a Chandrapur-based party worker, Chavan is heard saying that he too was planning to resign as the party’s chief in Maharashtra. Meanwhile, in a major jolt to the party in Marathwada, party’s three-term sitting MLA from Sillod constituency and former Maharashtra minister Abdul Sattar, on Saturday, rebelled against the party and decided to contest as an independent candidate from Aurangabad. “I’ve tendered my resignation to the party today. I will try my luck in the parliamentary elections from the Aurangabad Lok Sabha seat,” said Sattar. While he didn’t elaborate on the reason behind his disenchantment with the party, sources said that he was unhappy for being sidelined in the decision-making process of selecting a candidate from Aurangabad. On Friday, the Congress chose to nominate Subhash Zambad, who belongs to the Jain community, from the seat. Sources revealed that Sattar had been arguing that a Maratha or a Muslim candidate was the party’s best bet to take on four-time Shiv Sena MP Chandrakant Khaire. Several local Congress workers believe that Zambad’s candidature would work against the party’s interest, and ease Khaire’s path. “Aaj main azad hoon (I am a free man today). I will be contesting as an independent candidate from Aurangabad. I’m sure the Congress is happy as well,” said Sattar. But he refused to comment on the reasons for rebelling against the party or criticising the Congress leadership. “I have been in politics for the past 36 years. I’m keen to check my standing within the people whom I have worked for so long,” he added. Sattar, who was once seen as Chavan’s protege, has had an uneasy relationship with him in recent years. In 2016, he had raised allegations against Chavan and Leader of Opposition (Legislative Assembly) Radhakrishna Vikhe-Patil, alleging that both of them were only interested in safeguarding their own personal fiefdoms. While he had subsequently patched up with Chavan, their relationship appears to have soured further. The party’s campaign in Vidharbha too is in tatters. While the final day for nominations for the first phase of polls in Maharashtra falls on Monday, the Congress is yet to decide its candidate for the Ramtek Lok Sabha seat. While the names of Wasnik. party’s SC cell national chief and former Maharashtra Minister Nitin Raut and former IAS officer Kishor Gajbhiye, who recently joined the party, have been doing the rounds for a long time, the party has failed to evolve consensus over one name. There is already a controversy that has erupted over Bangde’s nomination in Chandrapur. The party had initially planned to field Vishal Muttemwar, son of former Nagpur MP and Union Minister Vilas Muttemwar, for the constituency. But the latter had backed out after a backlash from local party leaders. It was then in talks with Warora Shiv Sena MLA Balu Dhanorkar, whose name was in contention. Dhanorkar, who has decided to contest the seat as an independent, is seen as a tough competitor against BJP’s sitting MP Hansraj Ahir, also the Union Minister of State (Home). In Nagpur too, the party had vascillated a lot before selecting Nana Patole, an outsider, thanks to intense groupism within the Nagpur Congress party. In Akola, the party has no name yet to put up against BJP’s three-time MP Sanjay Dhotre. Abhay Patil, who was associated with Sangh parivar and had joined Congress recently due to differences with Dhotre, was zeroed in by the Congress. But due to some technical glitch over Patil’s continued service at Government Medical College there, the party had to look for another candidate. Now, it is mulling re-nominating last time’s loser Hidayat Patel. But Patil is insisting on nomination for wife Rekha. “The party had such a good opportunity for revival in the region. But it is squandering it due to indecisiveness and groupism. Over the past five years, the party has made no efforts to rebuild and cultivate new leadership. Hence, it had problems finding good candidates. This is sending a very negative signal to the voter,” said a senior party leader on condition of anonymity.